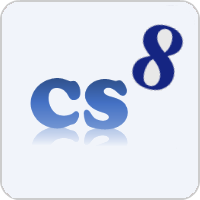 With CS8, you can load S8 applications (snapshot or module based apps) in a hosting .Net application and execute smalltalk expressions at any time. All the .Net objects can be exposed to (are visible from) S8. The hosting application can expose any object and/or libraries (it is also possible to dynamically expose objects/libraries from S8 side). All the objects visible through .Net reflection can be used from S8. Your starting point for S8 development for .Net is a minimal Demo snapshot/application that can be customized (from files under S8 folder) to load precompiled S8 code at startup. Download and install ClearScript library. It is not required to compile V8 if you don't want to build with latest V8 VM, because you can download the V8 precompiled binaries from here. If you want to build V8, read the ReadMe notes of ClearScript project. Download and decompress the CS8Demo project under ClearScript installation folder, add the project to ClearScript solution, and recompile.